A list of the things we can do for you. 4.2- Capitalizing on the build quality and speed of the Angel gun, while updating it with today’s latest technology. 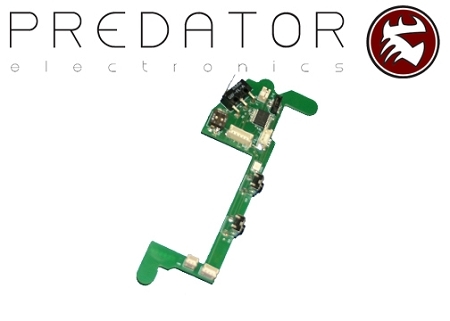 -And perhaps the most significant feature of the Predator board is the ability to add Predator Anti-Chop eyes. The eyes prevent the gun from "Chopping" paintballs during the extremely fast rates of fire that the Predator board is capable of. Eyes are not included in this package, but the board is ready for that upgrade as well. You can use angel eyes if your gun already has them, or you can add Predator eyes to any Angel. Please see the Predator PRO or Predator Ultimate Upgrade for more details. In our experience, the older Angels were built to handle far more than the technology of the time could really put out. With a little updating, and fine-tuning, your Angel will be shooting among the very best. NOTE: If you would like this board professionally installed, we offer that for free! You need only to send your gun into us, and we will install and ship the gun back to you. The only additional cost to you is the shipping both ways.